Admit it. 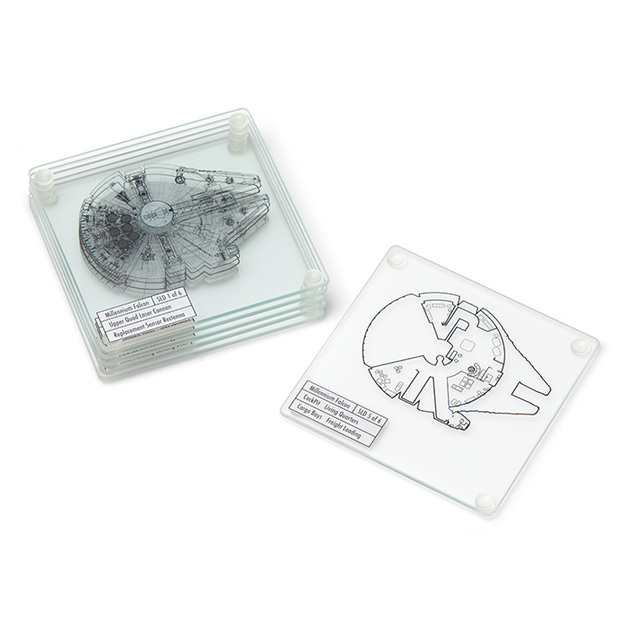 You got a little misty watching Star Wars: The Force Awakens, and one of those moments was when Han Solo and Chewbacca first stepped back on their old “hunk of junk” and Solo intoned, “Chewie, we're home.” Sure, you'd seen it in the trailers, but it was something special in the movie, a moment of triumph for moviegoers, 30 some years in the making. You, too, were home. 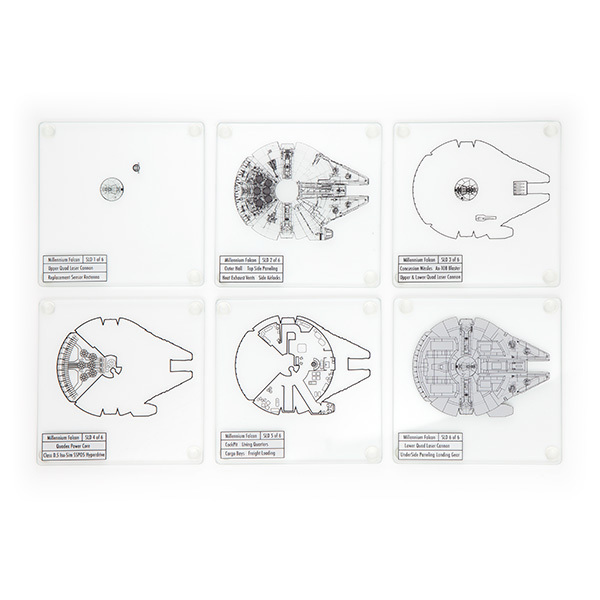 Let's geek out a moment here. 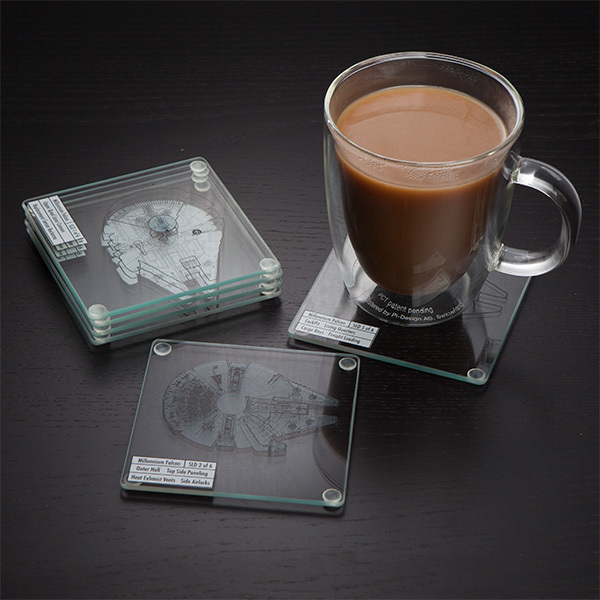 How do you know these coasters are post original trilogy? 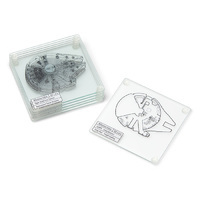 Since the top coaster says it's detailing the “replacement sensor rectenna,” this must be the Falcon after the Battle of Endor, when its original military-grade rectenna was snapped off. (See, we're geeks too!) Hand wash only. Not dishwasher safe. 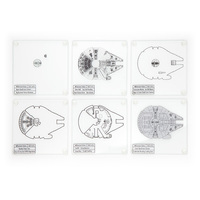 Bring the fastest hunk of junk in the galaxy to your place with this Star Wars Millennium Falcon Coaster Set of 6 glass coasters from Think Geek, each featuring a cross-section of detail from the Falcon herself. When stacked together, they build the ship in 3D and stand 1 1/4-inches tall. Individually, they measure 4-inches square x 1/4-inch thick, with rubber feet to protect your surfaces from scratching and condensation. That's a win either way!